From GFA’s website (until 12/16/15)The seal is gone. I have confirmed that Gospel for Asia is no longer a member of Independent Charities of America. A representative of the company which manages memberships has indicated that GFA was denied membership last week. 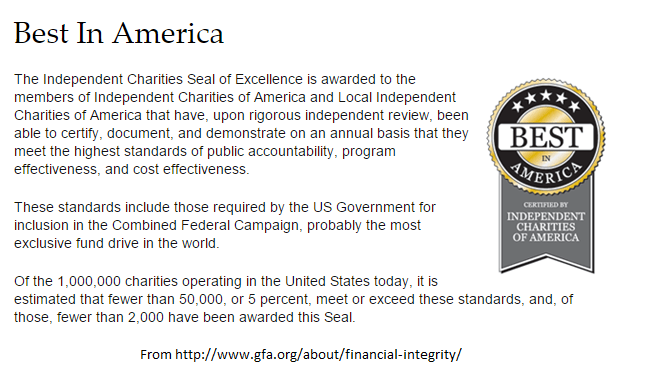 As of now, the Best in America Seal of Excellence touted by GFA has been removed from most locations on the GFA website (for some reason, it remains here at the time I wrote this). I have not been able to learn what triggered ICA’s action. I do know that ICA was aware that the Evangelical Council for Financial Accountability terminated GFA’s membership. In October, I reviewed the ICA criteria for membership. It seemed to me at the time that GFA did not comply with several ICA standards. One of the major standards used by ICA is approval by the Office of Personnel Management for participation in the Combined Federal Campaign. I have contacted OPM to inquire if GFA is still an approved charity. UPDATE: Today a Maguire & Maguire representative alerted me that the reason GFA was denied membership was because they failed to turn in their 2014 audit and their modified 990 form as required by their membership standards. 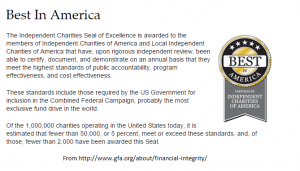 Maguire & Maguire provide management services for the Independent Charities of America.